Performers include: Tanika Ray (host) and J Boogie. A blend of news and entertainment, this newsmagazine series focuses on stories and trends for young adults age 18-34 (the CW network’s targeted demographic). CW Now features the latest in popular websites, amazing hotspots, hot fashions, cool music, must-see movies, must-have gadgets, and the latest gossip. 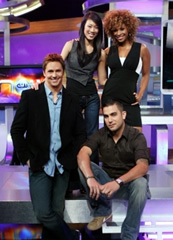 The series is hosted by Tanika Ray and J. Boogie is a correspondent.